The backgrounds, colors, and effects in these episodes were beautiful. It is great to see Bo-Katan leading the Mandalorians, it makes the best sense. These were definitively episodes for TCW and Mandalorian fans. I enjoyed them, but it’s less my cup of tea in general. I am waiting for the white loth-cat and the wolves . Bo-Katan seems to be an interesting character though. I like her wrinkle on the forehead. I was hypnotized by it. I find such detail cool. It makes it more real while remaining a cartoon. I had to reload a few times because the videos were breaking down. Annoying. I don’t know if I would call it flirting from Kanan’s side. To me it rather sounded like impatience with Hera’s avoidance of a certain topic, which if we go by the trailer for season 4, he will bring up in a more direct way at one point. It’s kind of funny because with Chopper’s reaction, you get the feeling that it’s not the first time they have this little conversation/fight, but it’s the first time we, the audience, get to see it. Yeah, book Thrawn and SWR Thrawn are a bit different. However, I found his question to Saxon about how he feels betraying his people very book Thrawn and you could tell he despised this betrayal of one’s people. Actually, I was wondering if Thrawn didn’t push Saxon to capture Sabine hoping deep down that maybe she would get him rid of that little would-be-dictator nuisance without him getting his hands dirty. Has Kanan become Superman? He’s force flying all over the place. Not complaining. I enjoy seeing him grow more powerful and do crazy stuff. Him landing on Sabine’s speeder like a surfer was a highlight for me. Yeah, I have a crush on Kanan Ezra jumping from one ship to the other in the cliff scene was cool too. Very action packed these 2 episodes. I haven’t watched the last 2 episodes yet, but saw this preview in my YT feed. They are really going the whole way with Kanan and Hera. I thought they would leave it more as subtext, but I guess not. I suppose that if they want to give all characters some closure by the end of the show, it makes sense. 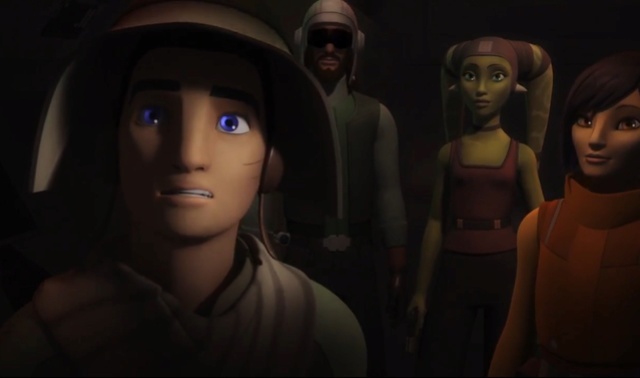 LOL at Kanan wearing Hera’s hat and some fancy glasses. Incognito, man. 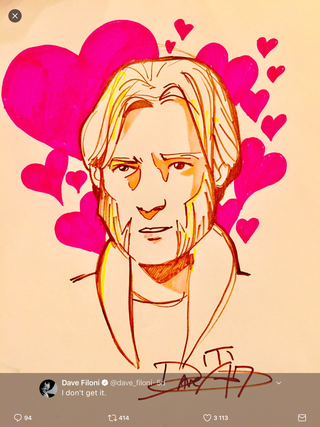 Remember when we were talking about interspecies romance? Yeah, LucasFilm doesn't care, LOL. Episoe 3 & 4 were soooo goood! Saw is off the hook crazy but you gotta love him. Filoni and his teases, I think he has become an excellent director his timing is impeccable. @spacebaby45678 wrote: Episoe 3 & 4 were soooo goood! Saw is off the hook crazy but you gotta love him. Filoni and his teases, I think he has become an excellent director his timing is impeccable. OMG, I agree. I loved these 2 episodes. Visually stunning. Well balanced. There’s a good rythm to it. I could’t keep my eyes off the screen. I loved so many things. Chop just cracks me. I nearly cried laughing when he crashed into the dish. And the poor thing gets another paint job every other episode. This time it’s yellow. Oh, and Kanan telling him “No, Hera said you will get an oil bath”. Or the prisoner “That droid is cross-wired” followed by Chop attacking a stormtrooper and slapping him like crazy. Even Ezra had his moments waving at the Star Destroyer. And what’s with the stormtroopers screaming like “terrified girls”? You gotta give it to DF, he knows how to include humor. the unstable kyber crystal. That was impressive. If we get visuals that impressive in TLJ, I’ll be clapping my hands in delight. And we’re really getting closer to R1 and ANH. The tension is rising. It’s exciting. I know I’ve said that before but I really like Kanan and Ezra’s relationship. It’s becoming every day less master-apprentice and more friends. I love that Kanan lets Ezra speak his mind and takes his point of view into consideration. I know many still believe Ezra will fall to the Dark Side, but I don’t see it. There’s so much respect between the 2 and I strongly believe that it’s because Kanan gives Ezra freedom and puts his trust in him that Ezra will not turn. He’s matured so much. Kanan too because he did restrain Ezra at the begining and then learned to let him go and find his place on his own. It made me wonder what kind of teacher Luke was in general and to Ben. Mama Hera is very protective. I love it when she calls Ezra and Sabine “the kids”. I love Kanan and Hera, and am happy they're addressing their relationship...my only fear is that the rebellion might end up breaking their relationship....I would so hate that...I want to see force sensitive hybrid kanera children in some upcoming novel/comic/tv series. Well, my first thought when I saw that clip was “Kanan is toast”. Making their relationship so obvious feels like a consolation prize. I could see Kanan die in one heroic act. Hera could be pregnant. “Hero dies leaving his pregnant girlfriend to raise the child on her own” is very cliché, but why not. But then they don’t have to address that in the show and could just leave the door open. And one day there is a comic starring a mysterious human twi’lek . My preference would be a girl just because I like the way they look. We shall see. I am very laid-back as to where the story goes in SWR. I let myself be surprised. Another clip for the next episodes features the white wolf! I am so excited! The clip for next week’s episodes looks amazing! Did anyone else hear the wolf telepathically call Ezra’s name? Maybe I’m going crazy but I could swear I heard it. I rewatched it a few times to make sure. I can’t hear it, but I don’t have my earplugs on and can’t put the sound up due to the late time here. I just hear that beautiful short howl. I think wolves’ howl is the most beautiful sound in the world. I am deeply fascinated by wolves. 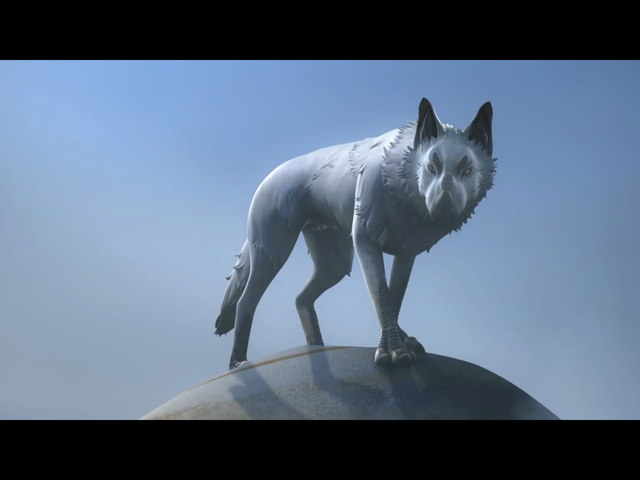 I would not be surprised if the wolf does have a telepathic connection with Ezra, who connects with animals naturally. 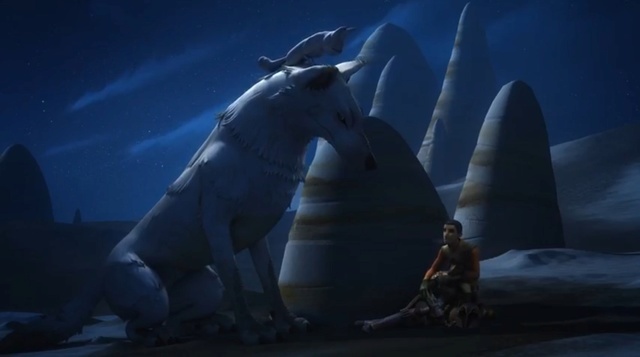 There was this scene of Kanan with the wolf in the trailer for Season 4 that also gave the impression of them connecting through the Force. In any case, that wolf is no ordinary wolf and I can’t wait to see what it’s about. You can definitely hear it better with earplugs/headphones. It’s so quiet. Almost like a howl mixed with a whisper. I am really excited about this episode. I love the Force mythology and mysticism behind it. Plus the wolves don’t hurt either. The SW team certainly knows how to create some amazing and memorable creatures. I always forget StarWars.com posts various information on the episodes. They apparently have trivia galleries. I just saw episodes 5 and 6. I am in awe. This is animated cartoon at its finest. The cinematography, the story, it’s just all so beautiful and engaging. Episode 5 showed what occupation of a planet means. Side note: I love Sabine’s darker hair color and Hera is one hot lady! The imperial music in the bar which is now under Imperial control is just a fantastic moment. It definitively had some WWII vibes to it. And then episode 6 was just a blast for the animal lover in me. Loth cats and loth wolf. Heathen! And the cats have this roary meow that my cat uses sometimes. They are the cutest. And the wolf is just beautiful and majestic. I can’t help posting screenshots. The group of 3 following the team around during their mission. Zeb not too sure about how he feels about the cats, but they love him. Ezra getting cuddly with one of them. OMG I loved when they attacked the stormtroopers. I was thinking “that could be my cat”. The Loth wolf is huge. Look at this face. I want to hug it. We’ll see it again. I will watch them again tomorrow if still available. @SanghaRen wrote: I just saw episodes 5 and 6. I am in awe. This is animated cartoon at its finest. The cinematography, the story, it’s just all so beautiful and engaging. Out of the two, episode 6 was my favorite! Like you, the animal lover in me just melted. Especially with those Loth-cats at the very beginning. I hope it’s not warging and she or he is just an evolved wolf that taps into the Force. I like the idea that all beings are connected through the Force and some can tap into it. 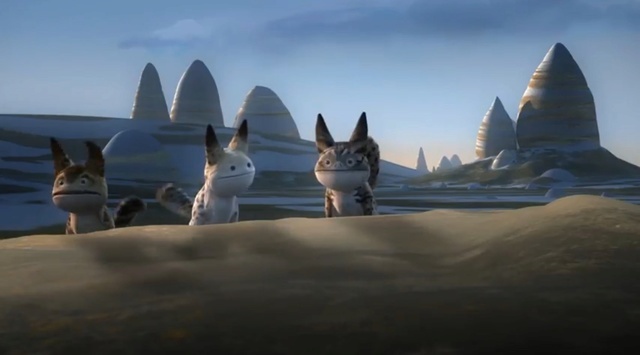 Even the Loth cats seem to understand what Ezra wants - a diversion for instance - and I believe the idea is that they do so through the Force. Thinking more about it, I would probably put the wolf more into the category of the Bendu, maybe. We’ll see soon, I guess if it starts speaking eloquently or not. I could not understand what he/she said neither, but yeah my first instinct was also that it was “doom”. Interesting information on starwars.com. 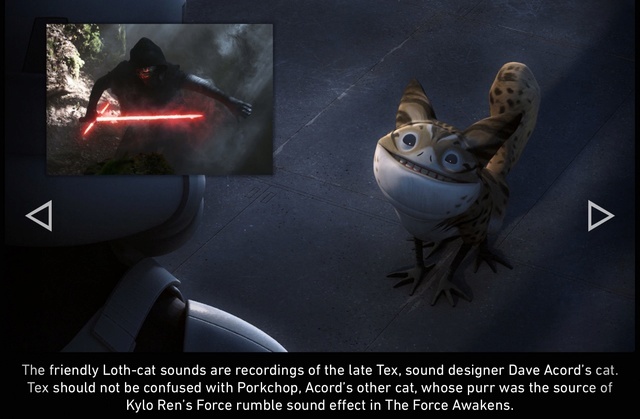 Do not confuse the Loth cats’ sounds with Kylo’s force sound And RIP, Tex. Honestly, the name of the cat for Kylo’s force sound is just so... not Dark Lord material Another reason for Kylo to be angry. Do you think DF is having a battle of cuteness with RJ: loth cats against porgs! I'm drowning in all the cuteness and I love it!!! doom or Dume? Dume is the real surname of Kanan. @panki wrote: I'm drowning in all the cuteness and I love it!!! It was Dume - confirmed by the subtitles. Intriguing, huh? 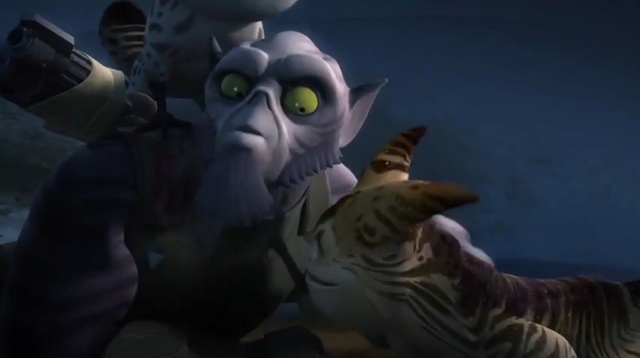 Oh that is intriguing..... now I cannot help but think back to Bendu teaching Kanan to find harmony with the spider creatures on Atollon in the previous season....and whether he is turning into some version of the Bendu. Oh, wow. Does Ezra know this? I guess he would. Why would Kanan hide this from him. I find it strange to call someone by their last name... Could the wolf then mean the Dume family rather than Kanan himself? I admit I don't know much about Kanan's backstory. These episodes were quite good! The humor was great. I was happy to see Jai Kell again. And Kallus and Rex interacting. And my favorite part was when Thrawn said that if it had been Hera in the TIE, their fighter's would never have lasted so long xD. 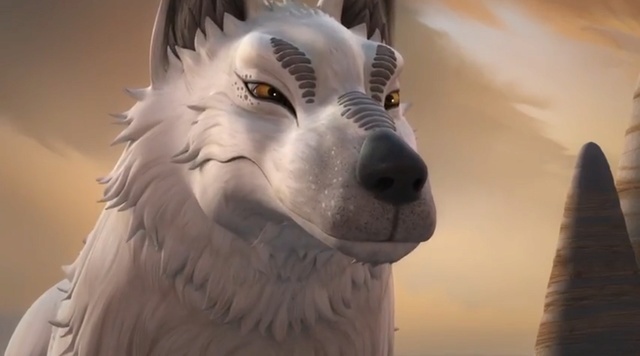 I guess it makes sense if the loth wolf was saying Dume since we know from trailers that Kanan will interact with them. And haha Kanan did seem like he was becoming like the Bendu when he told Ezra "all paths are coming together" and then said he had no idea what it meant xD. I'm not sure Ezra knows Kanan's real name....but I think the Grand Inquisitor, Ahsoka and Yoda definitely knew his real name. I also suspect that Kanan's master Depa Bilaba could be trying to communicate from the spirit realm. In canon, she was a little like Qui Gon Jinn when it came to her views on the force (the Kanan - the last padawan comics) and even questioned the jedi's role in the clone wars etc.....Kanan and she shared a force bond as well, and this was the third confirmed force bond in canon. She was killed by the clone troopers saving Kanan's life. Maybe the force bond transcends death in some way and she reached out to save her padawan's padawan? I'm taking a wild guess here. I have that comic on my night table since the SWCO - actually I have 3 copies of it because they were selling it for a good price and I was going to give it to some people and didn't. I haven't read it yet. I don't know why. That's my task now. I am still confused as to why the wolf used the last name, but then Luke is also called by his last name sometimes so I guess I should not read into it more than there is. I am pretty sure Hera also knows btw. Sorry, double posting, but I am kind of like a kid at X-Mas with all the SWR stuff. Oh, I loved when Thrawn said that about Hera too! Thrawn was really cool in that episode. The way he looks at Ezra and says “fascinating”... Nothing disturbs his cool. I forgot about Hera....she would have learned his name after they began working together....he definitely would have confided in her....as for the comics, they're definitely worth reading! Maybe the GFFA has some protocol about last names before first...who knows? 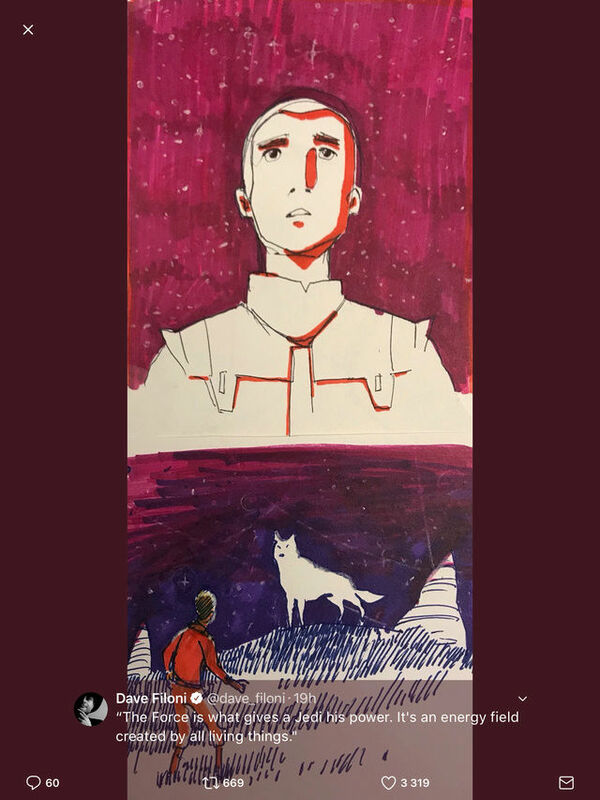 Something struck me today.... Something might happen to Kanan (the wolf saying Dume) and Ezra could blame the rebellion for not helpling them....he could then choose to become a Mandalorian and leave the rebellion with Sabine. 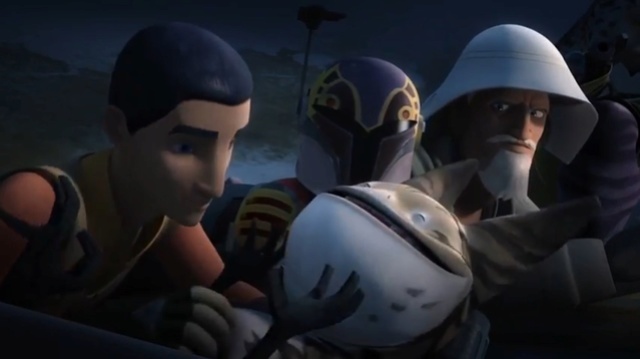 There are signs that could be taken as clues of Mando Ezra such as the discussion about Mandalorian armor, him saying he could get used to a jet pack in episode 3, his holding Sabine's hand on more than one occasion, the awkwardness around Sabine's dad, the absence of Mandos in the rebellion etc.